They stem from the fact that you'll need to look fresh and charming throughout the day. Not vulgar and lost in the bright overflow of night lights. The bride should have a fresh look and be the most beautiful. You will have no time to go to a makeup artist to change your daytime makeup for an evening one, and to fix makeup in the bathroom is not appropriate for the self-respecting bride. 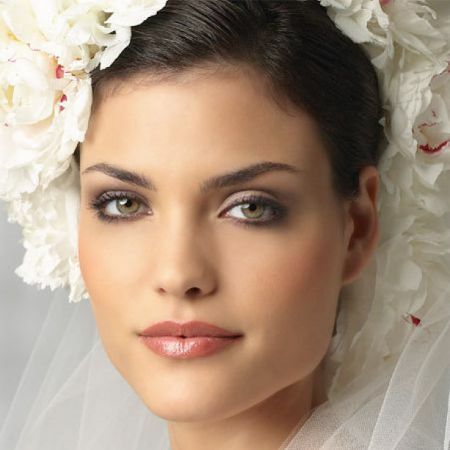 Consequently, wedding makeup should be not only ideal but also long-lasting. It's not an easy task. So, don't save money on makeup artists and professional cosmetic products on your wedding day. 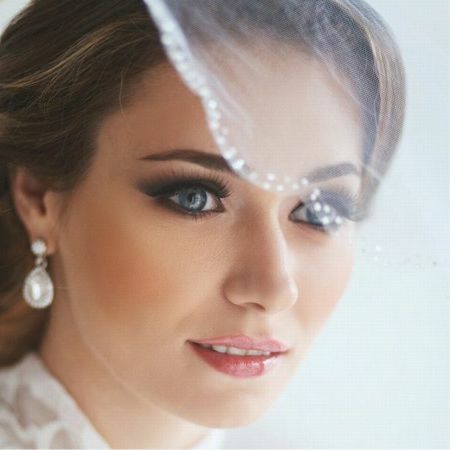 A perfect wedding makeup is a very delicate work and only professional hands and tools can cope with it. You need 100% confidence on your wedding day. The wedding dress sets the tone for the color palette of choice. If it is white or cream, stop on pastel, soft, or light colors. However, if the dress is white, choose cool colors like light blue, light gray, and muted purple. If the dress has a beige hue, focus on warm colors, such as all shades of beige, sand, soft turquoise, and champagne. The color of lipstick should be chosen in pastel, not bright colors. An exception is only if you wear a red wedding dress. In this case, the lips should be the second bright spot, and eye makeup should be minimal. Try to avoid any rough shades. 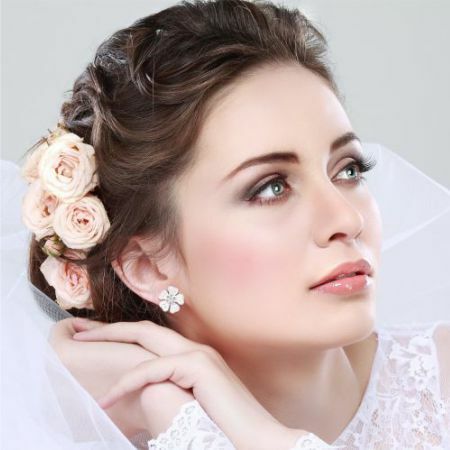 How to choose makeup for your wedding? ★ When choosing a tone foundation, you should be guided by skin tone. And not only the face but also the hands and décolleté. It is advisable to visit a solarium several times in advance so the skin can look healthier and smooth. ★ Since the bride comes to city hall in the afternoon and the entire photo shoot usually happens in daylight, the alignment of the skin should be given special attention. We cannot cover every flaw with concealers, as it can be done with evening makeup. No face cleansing in the last two weeks before the wedding, even if in the beauty salon they convince you that it will be healed before the wedding. Maybe it won't, and then what other options are there? However, you should take care of yourself at home the last week before the wedding. Make appropriate masks, use a light scrub that will not hurt your skin, etc. Foundation for the makeup should not only be of high quality, but also an easy one. Otherwise, your face will "float" until the evening. If you use loose powder, it should lay ideally. It is unacceptable if you see some remains of the foundation on your skin in a magnifying mirror in the bright light. How to make a charming wedding eye makeup? Mascara can be black, gray, or brown. It's better not to experiment with other colors. Gray mascara is recommended to blondes, and brown to chestnut-haired women. ★ You shouldn't overdo eye makeup, even if you use pale lipstick or lip gloss. The image of the bride will lose its lightness and innocence. 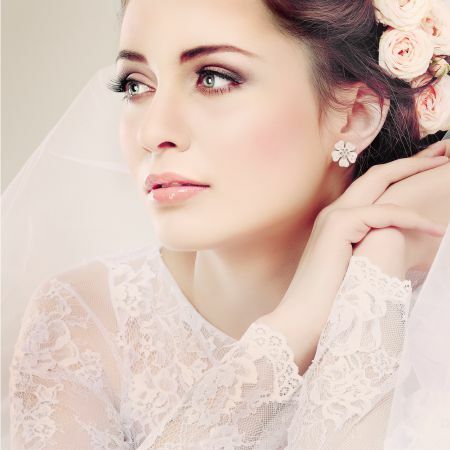 Like the article «The Main Rules of Wedding Makeup»? Share it with friends!